Abu Dhabi: Aldar Properties announced on Wednesday that it is creating a new subsidiary by transferring Dh20 billion worth of assets to attain better efficiencies and raise capital. The Abu Dhabi listed company has set up a new subsidiary called Aldar Investment Properties, the company’s top executives said at the launch of the firm. Aldar Properties has transferred some of its recurring revenue assets such as Yas Mall, Aldar Headquarters and The Gate Towers & Arc, and over 2,400 hotel keys, predominantly on Yas Island into the new subsidiary. The assets cover 5,000 residential units and over 500,000 square meters of prime retail and commercial space. The development follows the recent Abu Dhabi Executive Council decree, extending full onshore real estate ownership rights to Aldar Properties and its subsidiaries in Abu Dhabi. “Aldar Investments allows us to accelerate growth opportunities and unlock value for shareholders,” said Talal Al Dhiyebi, CEO of Aldar. “We believe Abu Dhabi’s real estate industry offers a compelling investment case, bolstered by a strong macroeconomic backdrop, commitment to growth and attractive real estate yields,” he added. Incorporated at Abu Dhabi Global Market (ADGM), the financial free zone of the emirate, Aldar Investments will actively assess opportunities to expand its asset base beyond traditional real estate asset classes. The new company also plans to tap the sukuk market with a new issuance in the short term. Aldar Investments has already secured a Baa1 rating by Moody’s — the highest rating for a non-government corporate in the region and one notch above Aldar Properties. Speaking to reporters at the launch of the new company in Abu Dhabi, Greg Fewer, chief financial officer of Aldar Properties, said their current existing debt amounting to Dh6 billion, will be transferred to Aldar Investments. When asked whether the firm has plans to take the new subsidiary into public, Fewer said it could happen in the future. 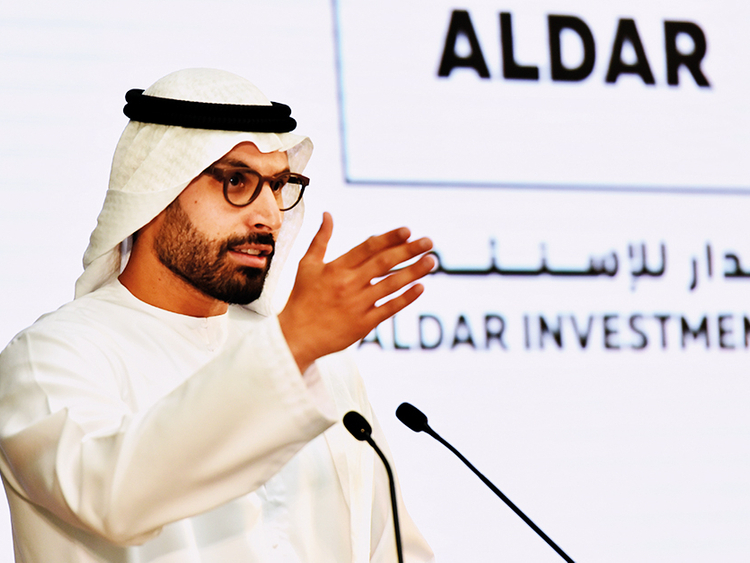 Elaborating further on the launch of the new company, he said this is a natural and logical next step in the evolution of Aldar as the firm’s portfolio of recurring revenue assets and also the market has matured. Analysts have reacted positively to the latest development. Ehsan Khoman, head of MENA Research and Strategy at MUFG Bank Ltd, Dubai said the newly formed entity will have the ability to raise capital independently, which will strengthen its capital efficiencies and bolster organic growth. “Aldar Investments’ firm positioning in the Abu Dhabi realty market, in conjunction with its diversified product mix across a multifaceted set of asset classes, such as in the residential, commercial and the retail space, bodes well for the entity’s prospects going forward,” he told Gulf News. Earlier this year, Aldar and Emaar properties have announced a joint venture partnership with a targeted investment of Dh30 billion to develop new projects in the UAE as well as in international markets. Aldar Properties also acquired Dh3.7 billion worth of assets from Abu Dhabi’s Tourism Development and Investment Company in a deal that is rated as one of the largest real estate acquisitions in the country to bolster its growth and expand its operations.